Managing social media seems so easy... Just post a few times each week and watch the bookings roll in, right? Wrong. Over the next few weeks, we'll be sharing everything you need to know for your business to develop a stellar new social media strategy. Roll up your sleeves. We're going to dig deep! We're kicking things off with part one - all things Facebook. Ready to get started? The first step to success on Facebook is glaringly obvious: you need to set up a Facebook page. There’s a ton of great information out there on how to do this, so we’ll skip over this part for now. Link to your Facebook page from your website. Put a link to your Facebook page in your email signature and in the footer of your marketing emails. Run some Facebook advertising (more on that later). One common misconception many people have is that you can grow your following by going and liking other company pages, hoping they’ll like your page in return (similar to other social networks like Twitter). The issue here is that when one page likes another page it doesn’t add to the “like” count and what you post goes into a completely different news feed (one that only that page’s admins can see). To increase your like count, you want to get likes from people, not companies. And, as vacation rental managers, it’s the people who you really want to reach, because people are the ones making bookings or listing their homes with you. One of the biggest keys to success on Facebook is understanding the algorithm Facebook uses to determine what posts to show which users and in what order. Formerly called EdgeRank, this updated algorithm has evolved to encompass machine learning and now considers close to 100,000 weight factors. However, we still think understanding the principles behind EdgeRank can give you a big advantage on Facebook. The EdgeRank algorithm factored in three main categories: Affinity, Weight and Time. Affinity – This metric measures how frequently you and your network of Facebook friends interact with content from a specific page or person. The most important factor in this is obviously how much you interact with a page. But, it’s said Facebook also takes into consideration how much your friends on Facebook interact with a page (the reasoning is that you’re more likely to be interested in things your friends are also interested in). Weight – Not all of these interactions with a page carry the same weight. For example, sharing and commenting mean more than just clicking Like. Visiting a page, mentioning a page and other actions related to the page are also thought to be watched and factored into the equation. It’s also believed that videos and pictures in posts carry more weight than links. Time – Since your feed is a “news” feed, it only makes sense to factor time into the equation as well. All things considered, older posts show up less and further down the feed than newer posts. Now that you understand some of the basic factors Facebook takes into consideration when including posts in people's news feeds, let’s discuss a few ways you can use this knowledge to expand your reach on Facebook. Getting better engagement on your posts is a great way to get more visibility. It's become particularly important for Business Pages, because over the last few years, the organic reach of posts from pages has fallen considerably. Some studies show average organic reach from page posts in the 2 to 3 percent range, with pages with more fans getting more organic reach than pages with fewer fans. There are a couple prominent theories as to why organic reach has dropped over the last couple of years. One theory is that pages were posting excessively in an effort to market to their followers, which in turn was crowding people’s news feeds. Others argue that with the increased monetization of Facebook, it makes sense for Facebook to give pages less organic reach, because they want pages to pay to “boost” posts to their fans. Regardless, it’s getting harder and harder to reach your fans on Facebook. However, there are still a number of things you can do to improve your page’s reach and get more engagement on your posts. Here are a few tips to get more reach and engagement on your posts. Use Facebook Live Video – Facebook recently added a new feature called Facebook Live, where you can broadcast live video to your audience. This has been a big push for Facebook, and it seems to be rewarding pages that use live video by giving them preference in their fans’ timeline and even notifying their fans when they go live. Use Facebook Video Instead of YouTube – Similar to the reasoning behind using Facebook Live, you can generally expect to be rewarded with more engagement when you use the features Facebook is really pushing. YouTube (owned by Google) is a competitor to Facebook, so they’d much rather see you use their own video service rather than adding a YouTube video link. Plus, Facebook will show live previews of those videos in your fans’ news feeds, making your post more attention grabbing. Share Your Instagram Images - Instead of posting images directly on Facebook, consider mixing it up and sharing an image from your Instagram account. Why? Because Facebook now owns Instagram and wants more people using it. Sharing an Instagram photo on Facebook lets Facebook promote another arm of its company. Post the Types of Content Your Fans Engage With – If you notice that posts on a certain topic tend to get more engagement, you should try to post more often on that topic. Here at LiveRez, we know that posts with pictures and videos of our team members and our partners get higher engagement than other posts. Try Using More Photos and Video – Photos and videos tend to get more engagement than regular status updates or posts with links. Optimize the Images in Your Link Posts – If you add a link to one of your posts, Facebook will auto-generate a preview with an image (if available). If no image is available you can add a custom image. Either way, you want to ensure the image displays properly by making it the right size and dimension (this social media image size cheat sheet should come in handy). If you don’t have a good photo editor, you can use an online tool like Pablo or Canva. Keep Selling to a Minimum – To be successful on Facebook, you have to realize why people use Facebook. People don’t go on to Facebook looking to a buy a product. They go there to interact with their friends, see news from their favorites sources and connect with the brands they are passionate about. Instead of selling, showcase something related to your product your fans would think is cool. Maybe it’s a video showing the beautiful views you can find on a local hike or a walk-through of home with some unique amenities. The key is to keep interesting and entertaining. Don’t Post Too Much – If you have awesome content to share every single day and your fans are engaging with it, go ahead and post a lot. But, if you’re posting just to post because you think volume wins the game, you should reconsider your strategy. Strive to add value to each of your posts. And if you have a day where you don’t have something great to post, just take the day off. Test on Twitter – If you want to predict how well a post will do on Facebook, post it a few times on Twitter first (assuming it isn't super time sensitive). You can get away with posting a lot more often on Twitter. And if you get a higher level of engagement on your post (relative to your other Twitter posts), you can make a safe assumption that the post could also do well on Facebook. Interact with Your Fans in the Comments – Interacting with your fans in the comments section is a great way to get more comments and drive more engagement. You can even go as far as tagging people who liked your post in one of that post’s comments thanking them for liking the post (just be careful to not abuse this strategy). Sometimes throwing out a question on Facebook can get you more comments. For example, let’s say you created a new Facebook group that is invite only. You could post about the new group and tell your fans to let you know if they want an invite to the group. Fans will likely comment on the post to let you know. Another great idea is to post a photo and challenge your fans to write a funny caption. NOTE: One thing you want to avoid is specifically asking your fans to engage with your post in the post itself. In 2014, Facebook started penalizing posts that prompted their friends to like the post, share it or comment on it. Remember those posts that said something like “Click LIKE if you’re having a good day.” Those went away quickly. Another thing to avoid is posting the same content multiple times close together, as Facebook is curbing reach on similar and duplicate posts. 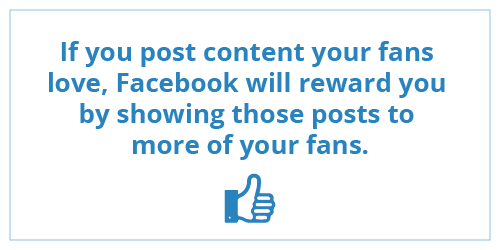 The main idea here is if you post content that your fans love, Facebook will reward you by showing those posts to more of your fans. In order to grow your presence on Facebook, you want to get more page likes. But, you also have to be strategic about how you do it. With the organic reach of pages dropping, it’s important to get good engagement on your posts, and you won’t get as high of engagement from fans that aren’t as targeted. Essentially, not all fans are created equally. A fan that engages is worth more than a fan that never engages (and likely won’t see many of your posts). Cross Promotion – As we mentioned earlier, you’ll want to make sure you have a link to your Facebook page on your website and in your emails. You also may want to cross promote your Facebook page on other channels, like other social media channels. There are even some services that can automatically take your Facebook posts and post them to your Twitter channel with a link back to your Facebook. Contests – This used to be one of the best ways to grow your following. You could run a promotion on Facebook that was only visible once someone liked your page (they were called “like-gated” contests). Facebook contests still work (we suggest you find a good Facebook app to administer the contest), but just not as well as they used to. Facebook has established some strict rules on running promotions. In addition, Facebook can manually remove likes from your page if they have reason to believe the likes are fake or were gained through a violation of their terms. Advertising – Over the past few years, this has been the primary way people have consistently grown their page likes. Facebook is becoming more and more of a pay-to-play network. But, the silver lining is that advertising on Facebook is relatively cheap compared to other channels and it’s targeting methods are really exceptional. Check out the next section to learn more. Advertising on Facebook is an effective way to get in front of more potential customers. And, Facebook gives you plenty of options to reach exactly the people you are looking for. When it comes to Facebook advertising, it’s important to consider both your audience and your goals. You want to connect with the right people and use messages that align with your current relationship with them. Think of your actions on Facebook like your actions in real life. For example, if you just met someone, you wouldn’t want to walk up to them and ask them to marry you (that would be creepy). But, if you’ve been dating them a while and you’ve been getting signs they really like you, then you’d be on more solid ground. The same goes for the subject of the conversation. You wouldn’t just walk up to a group of people, interrupt their conversation and start telling them what you do and why you are so awesome (those are the people you tend to avoid). Instead, you’d want to add value to the conversation, get them to like you, and then they’d WANT to know what you do. Also - in real life, if you’re trying to make more friends, you’d be better off going to a place where you’d find people who share similar interests or places where your friends and acquaintances hang out. Does this person already like my page? Has this person done business with me (or a similar business)? Does this person have interests that relate to my business? Has this person been to my website recently? With that in mind, here are a few ways you can target people on Facebook. Demographics – Build an audience based on demographics, such as gender, age, location, job, or interests (remember, Facebook has a ton of information about its users it can use for targeting). Custom Audience – Upload a list and let Facebook try to match it to current Facebook profiles. Vacation rental managers might try uploading a list of their past guests or travelers that have inquired about their properties. Once Facebook runs through your list, you’ll be able to advertise directly to those people. Lookalikes – Create a lookalike audience. After you upload your list to Facebook, it can expand your audience to people who have similar demographics to those in your list. 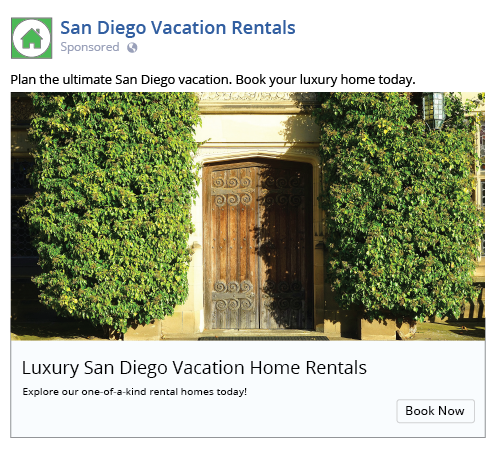 Retargeting – If you install Facebook’s tracking code (called Pixel) on your website, you’ll be able to target your ads to people who have visited your site (more below). Fans – Facebook also lets you boost posts to current fans of your page (and even friends of your fans). You can also choose to remove people who already like your page from any of your advertising audiences. If you’re advertising to people who aren’t current fans of your page and haven’t visited your website, you’ll want to make your content not as salesy. Focus on things that entertain and inform. If you’re advertising to your current fans, you can include content that is more brand-specific and promotional. If you’re advertising to people who have recently visited your website, you can assume they’re in the market to buy your product or service so you can get away with selling to them more. In this situation though, keep in mind that they’ve already been to your site and didn’t take the action you wanted. So, you might want to remind them of your brand and possibly sweeten the offer to give them that final push to convert. Just like with other marketing channels, it’s always a good idea to try a variety of messages and see which ones work the best with different audiences. And, one of the primary ways you can gauge your success is by using Facebook’s tracking tools. 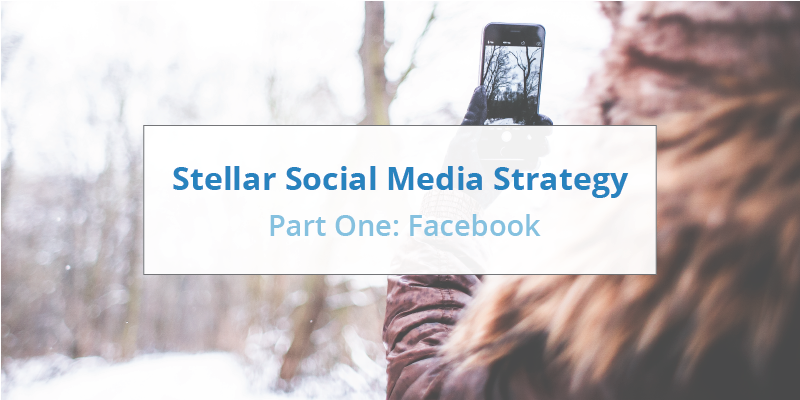 You’ve put countless hours of work into getting your Facebook strategy into tip-top shape. So, how do you know if your efforts are paying off? Facebook has some great built-in tools to help you figure out what’s working and where you can improve. Likes – Measuring page likes is one of the most popular ways to gauge success on Facebook. In this overview graph, you’ll see the number of people who liked (and unliked) your page. Reach – This graph shows the total number of times your posts have been displayed in your audience’s news feeds. The spikes on the graph show the posts with the greatest reach. Click on the graph to see which posts caused the spike. Be sure to make a note of them, as they’re the posts you’ll want to re-share or replicate moving forward to hopefully see that increase in reach again. Posts – As we talked about earlier, engagement is probably the most important factor in determining where your posts show up in people’s news feeds. This section of Insights overview dashboard shows how often your audience engaged (liked or commented) with your post in the past week. Click the graph to see the nitty-gritty details on which post types get the best engagement, which of your past posts have performed the best, and see when your audience is online (these times will often get the best engagement). People – Use the left-hand menu to navigate to the “People” section, where you’ll find data to help you get to know your fans. A good understanding of your audience demographics (age, gender, location, etc.) will help you to create more targeted, successful content. Note that many of these sections of Insights give you the option to customize the date range for the data, which will allow you to compare results over time. Additionally, you can export the data from the overview dashboard to dig a little deeper into Facebook’s valuable analytics. Take your analytics tracking a step further with the Facebook Pixel, which gives Facebook the ability to track actions that users take on your website. This data is incredibly powerful for a few reasons. First, it gives you the ability to retarget website visitors. By tracking the movements of visitors who are simultaneously logged into Facebook, it generates custom audience lists based on certain behaviors (i.e. people who have visited your website in the past 24 hours or people who have visited a specific page on your website). You can define these Website Custom Audiences by which pages they did or did not visit and during which time frame. Similarly, the pixel allows you to track when someone completes a booking, signs up for your newsletter or other custom conversions on your website. To set up Pixel Tracking, you’ll want to start by visiting the Ads Manager where you’ll generate your custom pixel. Follow these steps to place that code between the <head> and </head> tags of your web page. LiveRez users can send their code into Support to get the code placed on their website. Once the code is installed, head back to the Ads Manager to create your custom audiences and conversions! Hopefully this article has demonstrated that Facebook can be yet another effective medium for reaching potential customers. But before you jump in with both feet, make sure you have a good idea what you’re trying to get out of Facebook and adjust your expectations accordingly. Remember that many travelers use Facebook for inspiration and for travel planning. Facebook users are more likely to be an awareness phase than in a shopping phase, so you might be more successful if your goal is building brand awareness and keeping your business top of mind. But, that doesn’t mean that Facebook can’t work well for driving conversions, too. Just keep all this in mind when you’re fitting Facebook into your overall marketing strategy. ←First 2017 Honey Badgers: Jake Swapp and Heather Booth!